For the past two days, the field of 64 in the 2013 NBC National Heads-Up Poker Championship has been whittled down to the elite eight. On Day 1, the field was cut in half. On Day 2, the field was further cut down from 32 to what remains on Day 3 — the final day of action. Of those returning to action are Daniel Cates and Scott Seiver from the Clubs bracket, Mike Matusow and John Hennigan from the Spades bracket, Eugene Katchalov and Phil Hellmuth from the Hearts bracket, and Brian Hastings and Joe Serock from the Diamonds bracket. Those pairings will face off today beginning at 1 p.m. local time at Caesars Palace in Las Vegas, Nevada. Of the eight returning, only the matches of Hellmuth versus Katchalov and Matusow versus Hennigan have players with previous cashes in this event. Hellmuth won the event in 2005 for $500,000 and finished fifth in 2009 for $75,000. He's squaring off against Katchalov, who finished 16th in 2011 for $30,000. On the other side of the bracket, Matusow placed ninth in the back-to-back years of 2007 and 2008, both for $25,000. He's playing Hennigan, who finished ninth for $25,000 in 2005. Although Hastings can't say he's cashed in the NBC NHUPC, he did win Event 12: $10,000 Heads-Up No-Limit Hold'em at the 2012 World Series of Poker for $371,498. 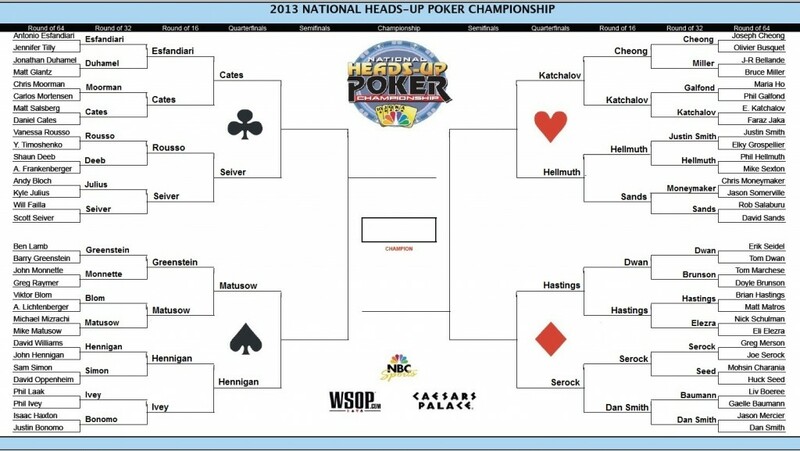 Who is your pick to win the 2013 NBC National Heads-Up Poker Championship? First place is a whopping $750,000 with all players guaranteed at least $50,000. Play is scheduled to begin shortly, so stay tuned right here to PokerNews for live updates of the action. [1:15 p.m.] The players from the CLUBS bracket and the SPADES are being mic'd up for play, and action will begin shortly. The match of Mike Matusow versus John Hennigan will be the feature table. Each player begins with 200,000 in starting chips and the blinds will be 1,000/2,000. [1:24 p.m.] The tournament host is making her introductions for hte camera. Cards will be in the air shortly. [1:28 p.m.] Cards are in the air, and the first two matches are underway. Daniel Cates is once again dressed in his finest as his opponent, Scott Seiver, has a more relaxed look with jeans and shirt. Mike Matusow is in good spirits as he is already laughing and cheerful. His opponent, John Hennigan, appears more serious and engaged in what's to come. [1:35 p.m.] It appears Scott Seiver has jumped out to a nice, early lead against Daniel Cates. Seiver has taken roughly 80,000 form his opponent, and the chip stacks are 280,000 to 120,000 in favor of Seiver. [1:40 p.m.] John Hennigan has inched out to a slight lead over Mike Matusow, but it doesn't seem to faze Matusow. He can be overheard singing, "I've got the whole world in my hands!" with a big smile. [1:44 p.m.] Each match began with the players 100 big blinds deep, but the levels last only 15 minutes. The next blind level is 1,500/3,000, and we don't predict these matches lasting very long. [1:46 p.m.] With that said, the blinds have now been increased to 1,500/3,000. [1:47 p.m.] Scott Seiver raised on the button, and Daniel Cates reraised all in. The shove looked to be a little over 100,000, but the dealer didn't announce the full amount to be heard. Seiver folded, and Cates picked up the pot. This is the second time Cates has moved all in against Seiver, winning the pot both times. [1:48 p.m.] John Hennigan continues to distance himself from Mike Matusow in their match on the feature table. Hennigan has built up to 259,000, leaving Matusow with 141,000. [1:52 p.m.] John Hennigan has moved to 275,000, and Mike Matusow has dropped back to 125,000. [1:53 p.m.] On the button, John Hennigan raised to 6,000. Mike Matusow called, and the flop came down . Matusow check-called a bet of 6,000 from Hennigan, and the dealer dealt the on the turn. Both players checked. The river was the , and Matusow checked. Hennigan bet an unknown amount, and Matusow quickly folded. [1:56 p.m.] It's a little bit hard to grab information from the secondary table due to the filming, but Daniel Cates has taken a slight lead from Scott Seiver. Cates now has 210,000 to Seiver's 190,000. [2:00 p.m.] The blinds have been bumped up again, and the matches are now playing 2,000/4,000. [2:02 p.m.] John Hennigan raised on the button, and Mike Matusow made the call to see the flop. After Matusow checked, Hennigan bet 8,000. Matusow check-raised to 16,000, and Hennigan called. The turn was the , prompting a check from both players. The river then completed the board with the . Matusow led for 15,000, and Hennigan called. Matusow showed just eight high, failing to bluff his way to this one as Hennigan tabled two pair, jacks and tens. Hennigan moved to 330,000, leaving Matusow with just 70,000. [2:05 p.m.] Daniel Cates has jumped up to 279,000, and now holds more than double Scott Seiver's 121,000. [2:10 p.m.] Things are swinging back in favor of Scott Seiver as he's back to 196,000. That's just about back to even with Daniel Cates, who holds the other 204,000. This match is a back-and-forth battle between the two young stars, while John Hennigan seems to have everything under control against his opponent Mike Matusow. [2:14 p.m.] John Hennigan raised to 8,000 on the button, and Mike Matusow called. The flop came down , and Matusow led with a bet of 8,000. Hennigan called. The turn was the , and Matusow fired 12,000 to take the pot. He's now back up to about 100,000 in chips. [2:16 p.m.] The blinds are up once again, and the level is 3,000/6,000. [2:20 p.m.] Mike Matusow had the button and raised to 12,000. John Hennigan moved all in, and Matusow called to put his tournament life on the line. Matusow flipped up the and was against Hennigan’s . The board ran out , and Matusow's trip kings gave him the double up. He now leads with 205,000 to Hennigan’s 195,000. [2:25 p.m.] Scott Seiver moved all in on the flop, and Daniel Cates made the call. Seiver held the for a pair and a flush draw. He was up against Cates' for two pair. On the turn, the landed and kept Cates in front. The river was the , though, and Seiver made his flush to double up. The two had nearly identical stacks, and Cates was left with just 4,000 in chips. On the next hand, Cates was all in with the . Seiver held a dominated , but the board gave Seiver the winning hand and awarded him the match. With that, Cates fell in eighth place for $50,000, while Seiver became the first member of the final four. SCOTT SEIVER ADVANCES TO FINAL FOUR. [2:30 p.m.] The blinds have been increased to 4,000/8,000. [2:35 p.m.] Mike Matusow and John Hennigan are just about even in chips, but there are only a total of 50 big blinds in play. [2:37 p.m.] Mike Matusow has 227,000 to John Hennigan's 173,000. [2:41 p.m.] John Hennigan rasied on the button to 17,000, and Mike Matusow called to see the flop. Hennigan bet 15,000, Matusow came back with a big raise, and Hennigan shoved all in. Matusow called, and Hennigan was at risk. Hennigan showed the for top pair against Mattusow’s for a combo draw. The turn was the , giving Hennigan two pair, but the river completed Matusow's straight and won him the hand. It also won him the match, as Matusow joins Scott Seiver as the second member in the final four. The crowd went off cheering for Matusow, but Matusow shouted even louder. “This is my time!” he yelled. MIKE MATUSOW ADVANCES TO FINAL FOUR. The next matches are scheduled to begin around 3:15 p.m. local time in Las Vegas, which isn't too far away. Stay tuned right here to PokerNews for more updates coming shortly. [3:05 p.m.] You guessed it, the Phil Hellmuth-Eugene Katchalov match will be the feature. Hellmuth's clan of spectators has taken up the entire first row on the rail. The dealer that dealt Hellmuth the winning hand last night is dealing to him once again, Daniel Rubalcava, on the feature table. [3:20 p.m.] Players have been called to set. They will get mic’d up then follow up with a group picture before things are kicked off. [3:40 p.m.] A little bit behind schedule, but the cards are in the air for the HEARTS and DIAMONDS brackets. With the blinds at 1,000/2,000 and starting stacks of 200,000, it's Phil Hellmuth versus Eugene Katchalov and Joe Serock versus Brian Hastings. The two winners will complete the other half of the final four. [3:50 p.m.] The room is filled with many more spectators than the previous set of matches, and most of them are here to see Phil Hellmuth. Let's see if "The Poker Brat" can deliver. [3:55 p.m.] The blinds are up to 1,500/3,000. [3:56 p.m.] Joe Serock and Brian Hastings looked to be involved in a big, early hand. The two were staring each other down as Serock fired 25,000 on the board. Hastings tank-called, but mucked after Serock showed two pair, kings and eights. [3:59 p.m.] Michael "The Grinder" Mizrachi has entered and taken a seat on the rail. Phil Hellmuth took the time to get off his seat to greet him. [4:03 p.m.] In a four-bet pot preflop, Joe Serock bet, 20,000 on the flop of . Brian Hastings called, and the turn came the . Hastings checked, and after some thought, Serock checked. The river card showed the , and Hastings checked once again. Serock took some time, then bet most of his stack of 144,000 to put Hastings all in. Hastings folded, and Serock won the pot. Serock increased to 292,000, and Hastings dropped back to 108,000. [4:11 p.m.] The match between Phil Hellmuth and Eugene Katchalov is fairly quiet with not much going on. That said, the blinds have moved up to 2,000/4,000, so the players will have a little more pressure on them. [4:16 p.m.] Joe Serock has been acting as the aggressor, and it seems to be paying off. He's still up around 300,000, while Hastings is floating around 100,000. In the other match on the feature table, Phil Hellmuth has a slight lead over Eugene Katchalov with 207,000 in chips to 193,000. [4:22 p.m.] Despite not being able to get much going yet, Brian Hastings is keeping in positive spirits with the help of his rail as they root him on. He recently commented to Joe Serock that leads up to believe he's not getting much help from the deck, either. "Folding eight-three offsuit is all part of my plan," said Hastings. [4:25 p.m.] Brian Hastings has 110,000 to Joe Serock's 290,000. [4:29 p.m.] Joe Serock has given some chips back to Brian Hastings, as he's dropped back to 253,000. Hastings is on 147,000. In the other match, Phil Hellmuth has edged out a lead with 235,000 to Eugene Katchalov's 165,000. [4:30 p.m.] The blinds have moved up to 3,000/6,000. [4:37 p.m.] Phil Hellmuth's lead against Eugene Katchalov has widened. The 2005 winner of this event has moved to 298,000, leaving Katchalov with 102,000. [4:38 p.m.] With the board reading , Brian Hastings made a bet of 37,000, and Joe Serock called. The river was the , completing a possible flush draw, but leaving just a pair of jacks on board. Hastings opted to check, and Serock took his time while shuffling his chips. After a minute, he moved all in. Hastings folded, and Serock won the pot. [4:45 p.m.] There have been quite a lot of wowing hands here at the 2013 NBC National Heads-Up Poker Championship, and this one proved to be another. Joe Serock raised on the button to put Brian Hastings all in. Hastings called, and Serock showed the . Hastings was ahead with the , but things wouldn't end up in his favor. The flop, turn and river came , and Serock backed into a diamond flush. Serock won the pot in yet another brutal runner-runner hand of the tournament and will be playing in the final four later today. JOE SEROCK ADVANCES TO FINAL FOUR. [4:46 p.m.] The blinds have increased to 4,000/8,000, and Eugene Katchalov has taken the lead against Phil Hellmuth. Katchalov has 222,000 in chips to Hellmuth's 178,000. [5:00 p.m.] Phil Hellmuth limped in on the button, and Eugene Katchalov checked his option in the big blind to see the flop come down . Both players checked, and the turn was a . Katchalov checked, Hellmuth fired a bet of an unknown amount, and Katchalov folded. [5:04 p.m.] Eugene Katchalov limped in on the button, and Phil Hellmuth raised from the big blind. Katchalov reraised all in, and Hellmuth made the call with . Katchalov had the . The flop came down 6c} and Katchalov's pair of tens was still second best to Hellmuth's jacks. The turn was the to keep Hellmuth in front, but Katchalov still had one more card to come. The was the river card, and that meant Katchalov was eliminated in fifth place. He took home $50,000, and Hellmuth solidified the 2013 NBC National Heads-Up Poker Championship final four. Upon winning, Hellmuth immediately began making the rounds to give his fans high fives. PHIL HELLMUTH ADVANCES TO FINAL FOUR. The final four of Scott Seiver, Mike Matusow, Joe Serock and Phil Hellmuth will recommence at 6:30 p.m.
[6:28 p.m.] The audience has been called to set, but the only player in sight is Joe Serock. Dealers are counting the stacks and taking their places. Play should begin shortly. [6:30 p.m.] Mike Matusow has made his way to the stage in what appears to be a slight wardrobe change. He has put on a blazer to compete against his opponent, Scott Seiver. [6:40 p.m.] The introductions are taking place, and play will be underway shortly. The match between Phil Hellmuth and Joe Serock will be the feature, and Mike Matusow versus Scott Seiver will be the secondary. Each player will begin with 400,000 in chips, and the blinds will kick off at 2,000/4,000. The cards will be in the air shortly. [6:45 p.m.] Introductions have been made, and the first hand was dealt with blinds at 2,000/4,000. Let's see who makes it to the finals. [6:46 p.m.] The crowd is lively as they cheer and chant for Phil Hellmuth and Joe Serock, who has a good handful of people on his rail. On the back table are Mike Matusow and Scott Seiver, who are already throwing jabs at each other. Though exact words could not be heard, laughs are clear. Seiver just said, “Yes, two in a row.” He then went on to say, "I cannot wait to play in the finals." @floesknowshoes please f***ing win your next match. please. [6:52 p.m.] Scott Seiver has fallen slightly behind Mike Matusow here in the early stages. Seiver has dropped to 385,000, while Matusow has increased to 415,000. [7:00 p.m.] Mike Matusow raised to 10,000 on the button. Scott Seiver made it 33,000 fom the big blind, but Matusow came over the top to make it 100,000. Seiver folded, and Matusow won the pot. Matusow moved to 440,000, and Seiver dropped to 360,000. [7:02 p.m.] Phil Hellmuth has taken a slight lead with 423,000 to Joe Serock's 377,000. [7:03 p.m.] The blinds have been increased to 3,000/6,000. [7:05 p.m.] Joe Serock raised to 14,000 on the button, and Phil Hellmuth called. The flop was , and Hellmuth checked. Serock bet 14,000 and got a quick fold from Hellmuth. [7:07 p.m.] Mike Matusow just shouted to Scott Seiver, “You’ve been winning all the tournaments and you know why? I ain’t there mother f***er!" [7:10 p.m.] Phil Hellmuth has 429,000 to Joe Serock's 371,000 in the feature match. Scott Seiver is down 314,000 to Mike Matusow's 486,000 in the other match. [7:16 p.m.] Phil Hellmuth has increased to 492,000, leaving Joe Serock with 308,000, while in the other match, Mike Matusow has 420,000 to Scott Seiver's 380,000. [7:18 p.m.] Joe Serock led the turn with a bet of 29,000 on the board. Phil Hellmuth made the call, and the river completed the board with the . Serock fired 69,000, and Hellmuth made the call. Hellmuth showed two pair, fives and fours, and Serock mucked his hand. Hellmuth moved to just over 600,000, and Serock slipped to under 200,000. [7:19 p.m.] The blinds have been increased to 4,000/8,000. [7:27 p.m.] Just in case you forgot, each of these players is guaranteed $100,000, but with second place worth $300,000, that means these matches are worth at least $200,000 in cold, hard cash. [7:29 p.m.] Things are getting serious. Both Phil Hellmuth and Joe Serock have put their sunglasses on. [7:34 p.m.] The blinds are up once again, and the players are playing 6,000/12,000. [7:38 p.m.] Phil Hellmuth raised the button. Joe Serock came back with a bigger raise, but after some time, Hellmuth shoved all in. Serock quickly folded, and Hellmuth won the pot. [7:41 p.m.] Scott Seiver, the short stack of the hand, raised on the button. Mike Matusow reraised, and then Seiver moved all in. Matusow quickly called with the . Seiver held the . The flop, turn and river ran out , and Seiver doubled to take a big lead. He now has 680,000 to Matusow's 120,000. [7:46 p.m.] Joe Serock open-shoved all in against Phil Hellmuth. Hellmuth called with the and was ahead of Serock's . Serock already has his backpack on as the board ran out , and Hellmuth scooped the pot to be the first player into the finals. Serock earned $100,000 for his fourth-place finish. PHIL HELLMUTH ADVANCES TO THE FINALS. [7:48 p.m.] Mike Matusow just doubled back to slightly over 300,000 when his made a straight to beatScott Seiver's on the . All the money went in preflop. [8:04 p.m.] The blinds are now up to 8,000/16,000. [8:08 p.m.] Scott Seiver has a very narrow lead against Mike Matusow with 405,000 to 395,000. Anybody's game in this one. [8:10 p.m.] Scott Siever limped the button, and Mike Matusow raised to 37,000. Seiver called. The flop was , and Matusow led with a 42,000-chip bet. Seiver called. The turn paired the board with the , and Matusow fired all in. Seiver folded, and Matusow won the pot. [8:12 p.m.] The blinds are up to 10,000/20,000, and Mike Matusow has 450,000 to Scott Seiver's 350,000. [8:15 p.m.] Mike Matusow raised to 40,000, and Scott Seiver moved all in. Matusow stared down Seiver, but eventually folded, and the two went right back to even. [8:17 p.m.] Mike Matusow limped on the button, and Scott Seiver raised to 50,000. Matusow called. The flop came down , and Seiver checked. Matusow bet 40,000, and Seiver called. The turn was the , and both players checked to see the land on the river. Seiver checked, Matusow bet 100,000, and Seiver went into the tank. "Stupid hand," Seiver eventually said. "It's unfortunate," he went on before making the call. After he called, Matusow tabled the for a full house, and Seiver mucked. "Yes, punish him!" exclaimed Matusow. "Has anybody seen Scott Seiver around?" Seiver dropped to 170,000 as Matusow has 630,000 of the chips in play. [8:20 p.m.] Scott Seiver has moved all in some to pick up some chips. He's back to 240,000, and Matusow has 560,000. [8:22 p.m.] Mike Matusow raised on the button to 40,000, and Scott Seiver called to see the flop come down . Seiver checked, and Matusow bet 40,000. Seiver moved all in, and Matusow folded. With that pot, Seiver moved back to 330,000, and Matusow slipped down to 470,000. [8:26 p.m.] The blinds have been increased to 15,000/30,000. [8:27 p.m.] After the blinds increased, Mike Matusow raised to 60,000 on the button. Scott Seiver called, and then both players checked the flop. The turn added the to the board, and Matusow bet 45,000 after Seiver checked. Seiver folded. [8:29 p.m.] Scott Seiver raised all in, and Mike Matusow called. Seiver held the , but was dominated by the for Matusow. After the board ran out , Matusow won the pot, and Seiver was eliminated. With that win, Matusow moved on to the finals and will face off against Phil Hellmuth. MIKE MATUSOW ADVANCES TO THE FINALS. I am so sad. not enough 2012 justice was able to seep over into 2013 to prevent this atrocity. Good luck to @themouthmatusow and @phil_hellmuth. Two of the nicest donkeys I've ever played with. I hope there's alot of draw outs!!!! Wishing My Bro @themouthmatusow best of luck! Take this down!!! Let's do this!!! Show Them why you still got a mouth on you!!! Matusow vs Hellmuth! The Mouth vs the Brat! Playing for the NBC Heads Up Championship and $750,000 in cash in 15 minutes!! The finals between Mike Matusow and Phil Hellmuth will take place at 9 p.m. local time in Las Vegas, Nevada. Stay tuned to PokerNews for all the updates. [9:00 p.m.] Phil Hellmuth and Mike Matusow have been called to the stage for the final match. Players will start with 800,000 in chips each and blinds of 5,000/10,000. The final match will be a best-of-three format, and the blinds will increase every 15 minutes. [9:18 p.m.] After a little bit of a delay, the cards are in the air for the first match of the finals. [9:20 p.m.] As a finalist, Phil Hellmuth has an opportunity to win this event for the second time in his career. He first won the inaugural NBC National Heads-Up Championship back in 2005 for $500,000. [9:32 p.m.] Not much has developed in the early stages of this match, but there is some friendly banter. Most of this words are coming from Mike Matusow, who recently commented, "I'm smart and you're dumb. You're scared and I'm not. You know why? Because you have to wear those stupid glasses!" [9:38 p.m.] The blinds are up to 8,000/16,000. [9:46 p.m.] In the first big pot of the finals, Mike Matusow raised to 32,000 on the button, and Phil Hellmuth reraised to 92,000 from the big blind. Matusow called. The flop was , and Hellmuth bet 90,000. Matusow made the call to see the pair the board on the turn. Hellmuth jabbed 250,000 into the pot, and Matusow made the call. The river was the , and Hellmuth moved all in. Matusow snap-called with the for quads and beat Hellmuth's . Matusow jumped out of his seat and high-fived his friend on the rail, Michael "The Grinder" Mizrachi. Matusow had less chips to start the hand and earned a double to 1.5 million. Hellmuth was left with 100,000. "You can't mess with destiny," commented Matusow after the hand. [9:50 p.m.] Phil Hellmuth limped in on the button, and Mike Matusow raised all in. Hellmuth quickly called with the . Matusow held the . Hellmuth's hand held up as the board ran out , and he doubled up. [9:52 p.m.] Just after doubling up once, Phil Hellmuth doubled back again when his defeated the for Mike Matusow. This time the board ran out to give Hellmuth the win. Hellmuth now has 600,000 to Matusow's even 1 million. [10:00 p.m.] The blinds are up to 10,000/20,000. [10:12 p.m.] Mike Matusow just scooped another pot to move to 1.1 million in chips. After winning the hand, he commented, "That time you let me bluff." [10:15 p.m.] The blinds have increased to 15,000/30,000. [10:16 p.m.] You're trying to play good, and I'm trying to play bad and get lucky," commented Mike Matusow. One thing is for sure, Matusow is really living up to his nickname of "The Mouth." [10:17 p.m.] Despite the table talk making for good television, the pots aren't that big at all. This last hand marked four limped preflop pots in a row. These guys are definitely treading lightly. [10:21 p.m.] Mike Matusow raised on the button, and Phil Hellmuth moved all in from the big blind. Matusow called with the , and Hellmuth held the . Even though Hellmuth ws dominated, the board ran out , and he doubled up. [10:25 p.m.] Phil Hellmuth had a little under 600,000 when he doubled up, and moved all in. Mike Matusow called with the . Hellmuth held the . The flop, turn and river ran out , and Matusow won the pot. He had more chips than the shorter-stacked Hellmuth, and with this win, Matusow claimed the first match of the finals. MIKE MATUSOW LEADS 1-0. [10:40 p.m.] The players have been called back to action to start the second match. The blinds will be reset to 5,000/10,000, and each player will start with 800,000 in chips again. [10:45 p.m.] The cards are back in the air for the second match of the finals. Phil Hellmuth must win this match to stay alive. If Mike Matusow wins, he becomes the champion. [10:50 p.m.] Mike Matusow has begun this second match much quieter than he did the first one. He seems a bit more focused on what is at stake — $750,000 to the winner. He's just one more win away from taking that title, but Phil Hellmuth still stands in his way. [10:55 p.m.] Phil Hellmuth raised to 20,000 on the button. Mike Matusow called from the big blind to see a board. Hellmuth bet 26,000, and Matusow called. The turn was the . Hellmuth bet 50,000 with a call from Matusow before the river card showed the . Both players checked. Matusow flashed a king, but Hellmuth's won him the pot. [11:00 p.m.] Phil Hellmuth raised to 25,000 on the button, and Mike Matusow reraised to 75,000 from the big blind. Hellmuth called. The flop came down , and Matusow bet 100,000. Hellmuth raised to 250,000, and Matusow moved all in. Hellmuth folded his hand, and dropped back to 622,000 in chips. Matusow moved to 978,000. Matusow made sure to chime in after the hand, "Mr. Hellmuth is getting frustrated." [11:02 p.m.] The blinds were bumped up to 8,000/16,000 just before the following hand. Phil Hellmuth raised on the button to 40,000, and Mike Matusow made the call. The flop came down , and Matusow bet 36,000. Hellmuth raised to 100,000, and Matusow folded. [11:10 p.m.] Phil Hellmuth raised to 50,000 on the button, and Mike Matusow came over the top with a reraise to 130,000. Hellmuth called. The flop came down , and Matusow checked. Hellmuth bet 60,000, and Matusow folded. Hellmuth has moved in front to 1 million. Matusow has 600,000. [11:15 p.m.] Mike Matusow raised to 40,000 on the button, and Phil Hellmuth reraised to 100,000 from the big blind. Matusow snap-shoved all in, and Hellmuth folded. [11:17 p.m.] The blinds are now up to 10,000/20,000. [11:19 p.m.] Mike Matusow raised to 50,000 on the button, and Phil Hellmuth reraised to 125,000. Matusow called, and the flop came down . Both players checked. The appeared on the turn, and both players checked again, this time to see the land on the river. Hellmuth bet 50,000, and Matusow called. Hellmuth showed pocket queens — — for a straight, and Matusow mucked his hand. "It's almost time, bro," sang Matusow after the hand. [11:25 p.m.] Phil Hellmuth has the small lead with 866,000 to Mike Matusow's 734,000 in chips. [11:32 p.m.] The blinds have increased to 15,000/30,000. [11:37 p.m.] Phil Hellmuth limped on the button, and Mike Matusow raised to 75,000. Hellmuth made the call, and the flop came down . Matusow fired 100,000, and Hellmuth called. The turn was the , and Matusow checked. Hellmuth, with his glasses on, stared at the board for a little bit, then fired 140,000. Matusow stakced up some chips and moved all in. Hellmuth threw his hands up in the air and asked for a count. In the end, Hellmuth found a fold, and Matusow took back the lead. "Weeeeeeee!" exclaimed Matusow, as he moved to 1.06 million. Hellmuth was left with 540,000. [11:45 p.m.] Mike Matusow raised on the button to 60,000, and Phil Hellmuth reraised from the big blind. Matusow moved all in, and Hellmuth called. Hellmuth was at risk with the and dominated against Matusow's . The flop kept Matusow's kings in front when the fell, but the on the turn vaulted Hellmuth to the lead. The river completed the board with the , and Hellmuth doubled to the lead. [11:47 p.m.] The blinds are up to 20,000/40,000. [11:50 p.m.] Mike Matusow moved all in on the button, and Phil Hellmuth made the call. Matusow held the and was at risk against the for Hellmuth. The flop, turn and river ran out , and Hellmuth won the match. He evened up the score, and the two players will now head to the third and final match to decide a winner. PHIL HELLMUTH EVENS THE SCORE AT 1-1. The third match will begin shortly. Stay tuned. [12:03 a.m.] Phil Hellmuth and Mike Matusow have been called back to the set to start the third and final match of the 2013 NBC National Heads-Up Poker Championship. [12:10 a.m.] Here we go, the cards are in the air for the final match between these two long-time poker pros. The stacks have been reset to 800,000 with the blinds starting at 5,000/10,000. The match seems to be taking a toll on both players, or at least for Mike Matusow, who looked to Phil Hellmuth and said, "I'm so tired, I'm not even listening." [12:16 a.m.] Right away, Mike Matusow has jumped out to a nice lead. He made a queen-high flush to move to 1 million. Phil Hellmuth dropped back to 600,000 and will have his work cut out for him from here. [12:20 a.m.] MIke Matusow raised on the button to 20,000, and Phil Hellmuth reraised to 70,000 from the big blind. Matusow then made it 170,000 to go, and Hellmuth folded. That means more chips for Matusow and a bigger lead. [12:21 a.m.] Mike Matusow limped on the button, and Phil Hellmuth raised to 20,000. Matusow called to take the flop, but Hellmuth had bet 20,000 in the dark. Matusow made the call. The turn was the , and Hellmuth fired 60,000. Matusow called again. The river was an unknown blank, but both players quickly checked. Matusow showed a pair of aces, and Hellmuth mucked his hand. With that pot, Matusow moved to 1.14 million. Hellmuth dropped to 460,000. [12:25 a.m.] The blinds are up to 8,000/16,000. [12:26 a.m.] Mike Matusow just took a bigger lead with the following action, although the bet amounts were unknown. He raised on the button, and Phil Hellmuth reraised from the big blind. Matusow called, and the flop came down . Hellmuth bet, and Matusow raised. Hellmuth gave it up and slipped even further. [12:35 a.m.] Mike Matusow raised to 32,000 on the button, and Phil Hellmuth called to see the flop. Hellmuth checked, and Matusow bet 30,000. Hellmuth called. The turn was the , and Hellmuth checked again. Matusow bet 105,000, and Hellmuth took some time. He placed a hand on his cheek, shook his head and looked at his cards. After a couple of minutes, he removed his sunglasses and said, "I'm thinking of making one of the worst laydowns of my life here." After a couple minutes more, Hellmuth raised all in. Matusow was now left with a decision as Hellmuth shouted with excitement, "Yes! You didn't snap call!" After some time, Matusow called with the for a flush draw. Hellmuth held top pair with the . On the river, Hellmuth needed to dodge a diamond to win the hand and double up or it would be all over. The dealer burned one last time, then dealt the on the river, delivering Matusow the flush and awarding him the tournament. "You gotta go for it, baby! I told you it was my time!" exclaimed Matusow after winning the hand. Hellmuth took home $300,000 for his runner-up finish while Matusow earned the title and $750,000. 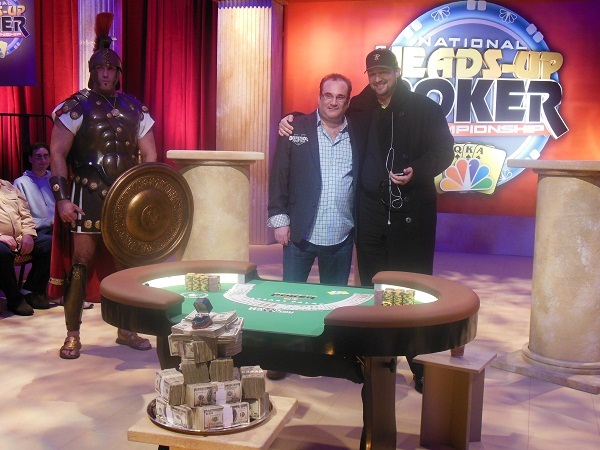 MIKE MATUSOW WINS THE 2013 NBC NATIONAL HEADS-UP POKER CHAMPIONSHIP. That wraps up the PokerNews coverage of the 2013 NBC National Heads-Up Poker Championship, and it was Mike "The Mouth" Matusow who proved louder than them all as he walked away victorious. With tears in his eyes, Mike Matusow accepted the ring for the championship title. When asked what this win meant to him, he modestly replied, "Yes, it is just a poker tournament, but it means a lot. For guys like me and Phil [Hellmuth], where everyone was making fun and upset that the final was us two, 'Oh Phil and Mike, what are they doing in the final?' You know what, we are the old guys, but where are the young players? They're not here. We are." Hellmuth added in defeat, "The world doesn't understand how great a guy Mike is. I tip my hat to him." To stay on top of everything poker related, follow PokerNews on Twitter and like us on Facebook.